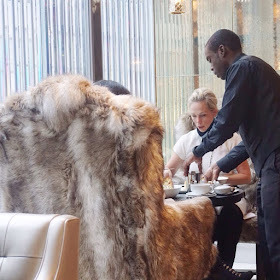 I've had many afternoon tea experiences in NYC, and always love to try new places. 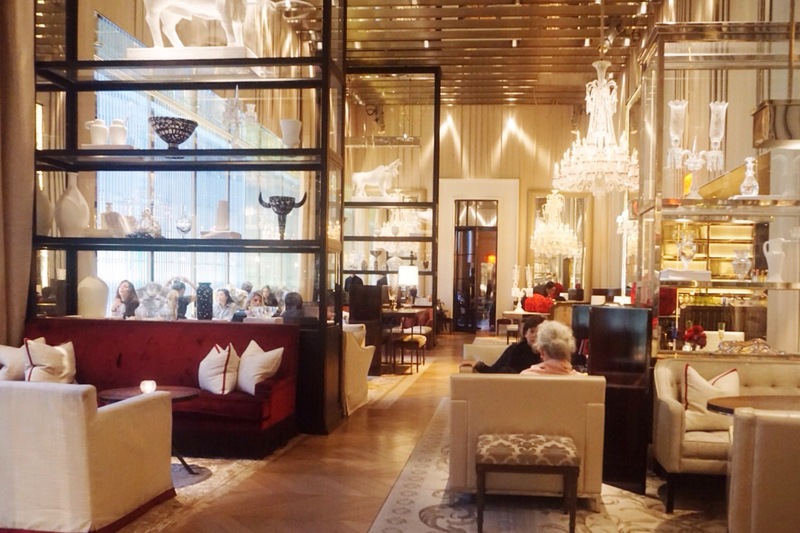 A few weeks ago I joined Jee and Lisa for a surprisingly delightful tea experience at the Baccarat Hotel in Midtown. I hadn't heard much about this fairly new hotel and didn't even know they offered afternoon tea. But Jee is always on the lookout for new spots, and she suggested checking it out. 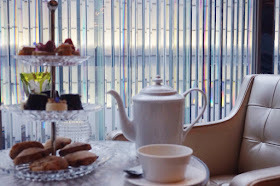 I was very skeptical in the days leading up to our tea- from the research I'd done it looked like an overpriced, over-the-top hotel and I didn't have high expectations. Tea is served in the 'grand salon' which sounded a bit too posh for its own good. Walking in to the hotel everything was dark and dramatic. But then I entered a palatial, sunny room twinkling with light dancing off all of the Baccarat crystal. Ok, it did feel a bit like a grand salon. This is a place sure to make you feel luxurious and important. Everything feels very 'cool', expensive, and decadent. Thankfully there is a friendly vibe to the staff, so nothing feels too terribly stuffy or snobbish. With all of the gorgeous Baccarat tableware, my nerves were a bit rattled. My klutz game is strong. But I tried to focus on the experience, and not my lack of coordination. I must note this may be the most expensive afternoon tea in NYC. Even more than the Plaza, which is overpriced with mediocre food (but in a glorious setting). A full afternoon tea at Baccarat is $80, which definitely gave me sticker shock. There is a smaller afternoon tea service for $65 called 'King Louis XV' but it only comes with one savory and a few sweet options. 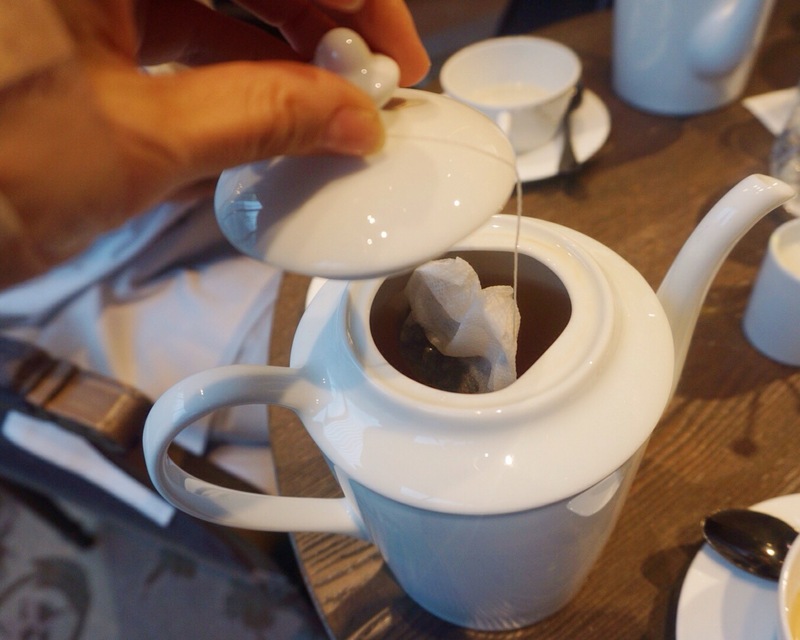 I can't believe I'm writing this, but the $80 'Prince of Wales' option is more worth your money, as you get an enormous amount of food, and a large pot of tea (with hot water refills). This is assuming you think paying $80 for afternoon tea is a rational thing to do in the first place! Roasted Chicken Roulade, Smoked Ricotta, Pesto on Everything Crisp Lobster Salad with Truffles on Buttered Parker House Roll Deviled Quail Egg with Sturgeon Caviar, Pickled Onion on Brioche Cucumber with Watermelon Radish, Goat Cheese on White Bread Smoked Salmon with Dill, Robiolina Cheese on Marble Rye Bread Pineapple Coconut Napoléon Lemon Ricotta Cheesecake Chocolate Sacher Torte Raspberry Roulade Assortment of scones served warm with Devonshire cream and crab apple gelée. The tea menu consists a nice list of Mariage Frères teas. I have enjoyed this French brand in the past, and it's difficult to find in restaurants and cafes in the area (but can be found in some specialty stores). I was a little disappointed to see that all of the teas were blends with added flavors. I usually prefer to go with a pure tea. After considering of all the sweet and savory bites to come, I chose the Black Orchid blend which is black tea with 'notes of caramel, vanilla, and spice'. I admit I enjoyed this tea, it was sweet but not cloyingly so. The vanilla worked well with both the sweet and savory food we enjoyed. It was smooth, a little earthy, and of course sweet. Not bad, but not something I'd select if I had a choice of pure teas. The tea is served in large pots so it took quite a long time before we needed refills. The leaves were cleverly suspended in filters inside the pot (see picture below) at just the right height so the tea doesn't sit too long and become bitter. After pouring a couple of cups, the tea isn't touching the water. Almost everything I ate was delicious, which is rare for an afternoon tea selection. There are usually a few clunkers but here almost everything was successful. The scones were perfectly light, moist, and crispy. The savory food was traditional yet interesting, and expertly prepared. The sweets were also quite good but by that point I was getting full. Throughout our meal we had attentive, friendly service. We were paid a few visit by the tea sommelier, Gabrielle Jammal. Gabrielle was knowledgeable and friendly yet professional. She is passionate about tea and was happy to chat with us. We discussed tea places in NY, her tea sommelier certification, and other tea-related chit-chat. It was lovely to talk with her and learn a little about the tea program she helped set up for Baccarat. Towards the end of the meal she brought us a strong, clean single-estate Assam to try that she's planning on adding to the menu. I'm relieved there will soon be pure teas to choose from! I want to go back and sit in one of the furry chairs!! 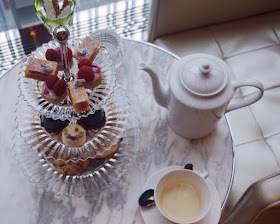 As expensive as this meal was, I cannot wait to return to Baccarat for afternoon tea. I'm eager to try the new teas they are adding to the menu. The food is delicious, the room is airy and stylish, and the service is attentive. It feels like you are tucked away in a decadent tea salon, which is exactly what it's supposed to be. Great! I don't know if the teas are fair trade. But I'm sure Gabrielle will know. If you want to email me (link at the top on this page) I can give you her email address if you'd like to ask her. Enjoy and let me know what you think! Mow I want to go too. It certainly is a tempting place! The white teapot makes for a snout pouring of tea. Thanks for sharing. Amazing article. Love it. Thank you for posting. It looks like an amazing experience. Thank you Eros! Glad you enjoyed it. Yes it was a great experience! How does the pricing work? Say I were to get the $80 and there are 3 guests in total? The menu online says: There is a share fee of $25 for each additional guest. How would this factor into the total cost? Thank you! Hi Leslie, we paid $80 per person, since we didn't share. We wanted all the treats to ourselves :) I'm not sure if you can just pay a supplemental fee of $25 for each additional guest. I can contact Baccarat and find out, or you could send them an email. Good question! Thanks sara for your response! I'll just assume it's best value to not share then hehe.